Calligraphy? Computers can do that! Back in 1986, calligraphy was no more than a hobby to me. But even though I wasn’t particularly proficient, I had a passion for the craft, and had already decided that I wanted to be a full-time calligrapher. 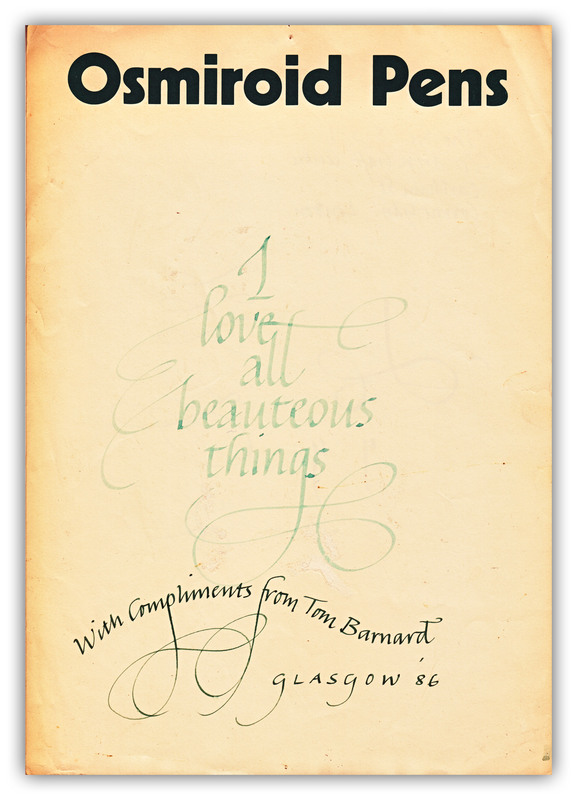 That year, I remember walking into an art store in Glasgow, and there, unexpectedly demonstrating calligraphy in the centre of the store, was Tom Barnard. I was familiar with Barnard, since I owned Making Calligraphy Work For You, an Osmiroid book that he co-wrote with Christopher Jarman. But I had never expected to meet him, or any other “real” calligrapher, in the flesh. I’m sure he wasn’t trying to demoralise me, or put me off following my dream. I think his intention was to simply advise me that such a career path wouldn’t be an easy one (on reflection, true). And that I would never find myself in a high income bracket (also, true). 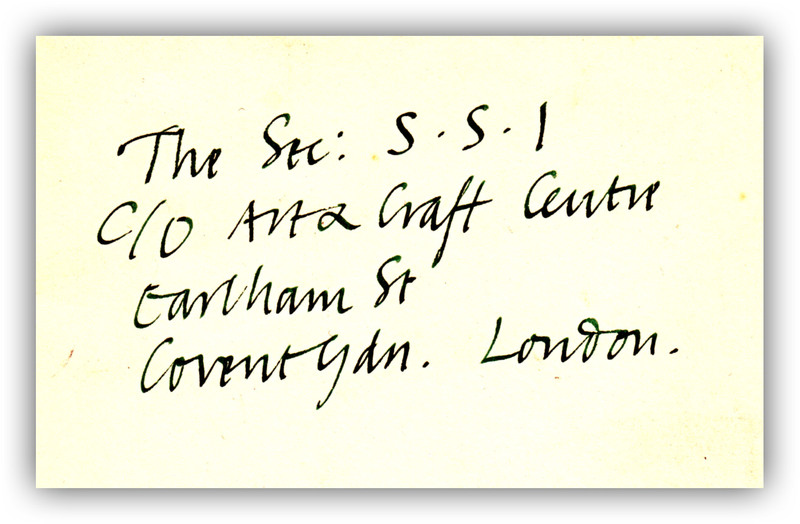 Possibly to soften the blow of his candidness, Barnard wrote down the address of the Society of Scribes and Illuminators for me, so that I could enquire about lay membership. He also gave me a signed A4 page of calligraphy that he created right in front of my eyes (which I still possess, and have featured above). I remember he used an Osmiroid pen, loaded with green ink, and I was mesmerised by his effortless letter-making and flourishing. Rather than dampen my enthusiasm, he inspired me with his expertise. And despite his honest advice, I was more determined than ever to be a professional calligrapher, like him. But turning my dream into a reality proved difficult, since very few people appeared to need/want the services of a novice calligrapher in the mid-eighties. And throughout those fruitless early weeks and months I became disheartened, and was constantly reminded of Barnard’s candid advice. There appeared to be a stock response from almost everyone I approached in my quest for commissions. “Computers can do that,” I was told, again and again. Folk appeared to be bemused because I was actually choosing to write text by hand, rather than type it on a keyboard. They simply didn’t get it, and so I fought calligraphy’s corner. Again and again. Yet, despite my protestations, and my efforts at enlightening the disbelievers, I failed to change this widespread ignorance towards calligraphy. Only a discerning minority appreciated that hand-lettering, when well-done, is so much more impressive than sterile computer fonts. Even when, decades later, I began to use my Apple iMac to create digital calligraphy, the computer was only a tool in the process. The computer didn’t create the actual calligraphy… I did, with my own fingers, using pen and ink! So in terms of creating calligraphy, in my opinion, computers still couldn’t “do that.” And I was convinced that would always be the case. Then, a few days ago, my son sent me a video. As I watched it, I couldn’t help but smile knowingly. After almost three decades of telling anyone who would listen that computers cannot do calligraphy, suddenly it appeared that they can. But despite the fact that I now have to grudgingly accept that computers CAN do calligraphy, there are quite a few missing ingredients, such as passion, personality, individuality and a little (controlled) imperfection. Calligraphy is so much more than simple letter-making. Maybe if, someday, I hear that a computer has put down its pen to give honest advice to a keen young incipient scribe, I’ll step aside to make way for this brand new breed of calligraphers. But, somehow, I think that day is a long way off. Find out more about the computerised calligraphy-creating machines at Sploid.